Recently, Massachusets became the first state to ban devocalization surgeries for animals. This will prevent anyone from damaging or removing an animal's vocal cords unless they have a valid medical reason. Now, those of you who know me well will know that I'm generally against laws that limit what a pet owner can or can't do with their animals, and I'm typically against bans. However, I wholeheartedly support this law, and I think more states should follow suit with similar legislation. I brought Gizmo home knowing that he could potentially be loud. (Fortunately, he is quiet most of the time, unless you count the screaming fits he throws when the cat kicks him off the chair.) Anyone who buys a dog does so with the knowledge that it can bark. I don't think an animal should be mutilated merely for the sake of fashion or convenience. Most dogs can be trained to obey a "be quiet" command; just about every dog training book I've seen has had a section on this. And even if training fails, there are plenty of effective, humane means of bark control available for noisy dogs, ranging from collars that produce a high-pitched sound or unpleasant vibration to gadgets that plug into the wall. 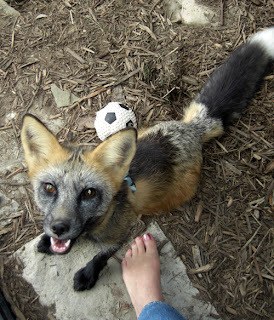 Even my pet fox uses barking, along with a wide range of other noises, to communicate with me. What do you guys think about this new law? Is a good thing, or do you think that it's too restrictive of pet owners freedom? Are there consequences that maybe we're not anticipating? Let me know in the comments! I read about devocalization surgery in a novel once, but I couldn't believe people would actually do it. That's horrid! How about they get their own vocal cords cut, and see how they like it? I was amazed when I first heard about devocalization too. It never ceases to amaze me some of the things people will do to their pets for the sake of convenience. I never knew about devocalization surgery before reading that! It's no surprise to me, though; just another cruelty people inflict on their pets, like declawing and such. I own a cat, I could never imagine cutting his vocal cords and never hear his cute meowing again. Hopefully other states can take the initiative to also ban devocalization surgery, or at least bring it up. I'm not entirely against devocalization surgery. I would never do it to my own pets, but if it's between dumping a dog at a shelter, or getting it debarked, it's better for it to be debarked and still have a happy home. The book I read about devocalization in was a Cold War era spy novel, written in the '80's. The dogs were 'debarked' for covert use in the Arctic. I can't imagine any other reason. If it's a choice between dumping a dog in a shelter or getting it 'debarked', then -train your blasted dog- or don't get one in the first place. it seems like a very reasonable law. i cant think of any reason why you would need to silence your pet. in fact thats why i like my dog so much, she seems to have a sixth sense that tells her when there is a stranger on our street and she'll start barking up a storm. the only one of my pets i might have had to do this to was a rooster i rescued from a fighting ring that would not hesitate to caw at all hours of the day. I grew up with a mom that showed dogs. Before she had my sister and I, she showed dogs much more, including huskies which can be very loud. However, she realized this and also realized that it would be disturbing for her neighbors if she was away and her dogs got upset about that. Her dogs were therefore debarked. However, one of her neighbors didn't like the dogs being there. he filed multiple complaints. One was a noise complaint -- ridiculous since her dog was debarked. Another was a sanitation complaint. A Health inspector came and discovered that my mom thoroughly cleaned the kennels every day. Finally, the man took matter into his own hands. He threw poisoned food into the kennels, killing my mom's dogs. now, my mom would never debark a dog for "convenience," as evidenced by her male chihuahua. However, in the instance where you have multiple dogs and neighbors that are willing to file nose complaints, I can see why she would. Hey Anon, your story is hardly an example of a situation where debarking would have helped anything, given that the neighbor murdered the dogs anyway. I agree with no de-barking laws. I worked in an animal shelter for a few years and had a dog come in that's bark was raspy and almost painful sounding and the poor thing (I think the name we gave her was Anna or Annabelle) had a very thick scar over her throat. When I inquired as to what that was, the owner casually told us that it was from a botched home-debarking. I sadly, did not have the authority to leap across my desk and visit violence upon their person, I very promptly took the leash from their hands and thanked them sincerely for deciding she wasn't for them. I later found out that they paid a person STUDYING TO BE A VET to do the surgery in their garage. I believe they were severely fined for abuse.